Ontario’s Toronto Idolo Futsal defeated Québec’s Sporting Montréal FC 6:1 to earn their first Futsal Canadian Championship title on 22 April, at Queen’s University in Kingston, ON. Last year’s silver medalists, Saskatoon Olimpia SK FC earned a bronze medal with a 5:2 victory over Québec’s Sporting Québec FC. Alberta defeated Manitoba 4:2 to secure fifth place while Yukon defeated Nunavut 3:2 to earn seventh place. In the final, Ontario’s Toronto Idolo Futsal got two goals from Damion Graham, and singles from Edson Jimenez, Christian Samaniego, Marco Rodriguez, and Eduardo Jauregui. Manuel Adair Chavez Melendez scored for Sporting Montréal FC. The tournament’s leading goal scorer was Toronto’s Damion Graham who scored 13 goals in four games including his 2 in the Final. Alberta secured 5th place with a 4:2 win over Manitoba. Carlos Melendez Salinas and Shawn Chamberlain each had two for Calgary Progressive FC. Alex Castro and Yahia Chihab had the goals for Winnipeg Rovers FC. Yukon earned 7th place with their 3:2 win over Nunavut. Carl Knickle had two and Simon Kishchuk the single for Whitehorse. Chad Graham and Kris Okpatauyak each scored for Rankin FC. 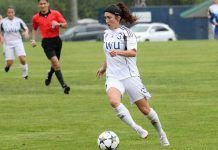 Two provinces and two territories participated in their first Futsal Canadian Championship as the competition grew from three teams in 2017 to eight teams in 2018. Nunavut’s Rankin FC were that territory’s first-ever Canada Soccer national competition entrant. Manitoba, Calgary, and Yukon all sent teams for the first time. Launched in 2015, the Futsal Canadian Championship is Canada’s top-level futsal championship. Quebec were the 2017 Futsal Canadian Championship winners, while Ontario were the inaugural 2015 and 2016 champions.